This installment of Purple Duck Games‘ Adventure Avenue-series clocks in at 59 pages, 1 page front cover, 1 page editorial, 2 pages of SRD, leaving us with 55 pages of content, though these have been laid out for pamphlet-size (6’’ by 9’’, or A5), which means that, provided your eyes can handle small text, you can fit up to 4 pages on a given sheet of paper when printing this. Now, first things first: On a formal level, the module sports two maps: One full-color regional map of the Burroughs of Dunmark, basically a horror-themed region of Porphyra, and a b/w-map of the dungeon featured herein. Unfortunately, we do not get a player-friendly version of the dungeon-map, which constitutes a comfort-detriment. On the plus-side regarding comfort, the module sports something that more adventures should have – namely, a list of treasure with selling value and rooms, if applicable, noted, and a second table that lists the XP-values of the threats faced within. Kudos for this nice GM-helper! The pdf does, however, come with a bonus files penned by Mark Gedak and Perry Fehr, which depicts the hagiographical drake, a CR 7 critter that breathes poisonous fire and which also gets speed bursts. Nice one! Back to the module: If the title and cover art were not ample indicator, this is a dark fantasy/horror adventure set against a fantasy backdrop; if you’re not playing in Porphyra, then it should be easy enough to integrate this into most campaigns. As the module makes use of the themes of Dream and some mythos-themes, it should easily fit into, for example, Fat Goblin Games’ Shadows over Vathak-setting, or adventure-sequences with dream- and cosmic horror themes. The encounters and locales sport brief read-aloud text sections, fyi, so yeah, this is very much helpful for GMs that have a problem improvising compelling descriptions. In order to discuss this module in more detail, however, I will need to go into SPOILERS. Potential players should jump ahead to the conclusion. The pdf sports a couple of nice full-color full-page artworks, btw. All right, only GMs around? Great! The PCs, via one of multiple hooks, are tasked to investigate the strange disappearance of Alra Vyrsmak and thus pick up her trail near the isolated and xenophobic village of Nirun’s Hillock. Already suspicious of outsiders, the climate of the village has not been improved by ill winds and strange dreams. The village gets its own village statblock, and the module here takes an event-driven form, using encounters to generate a growing sense of unease – the local shrine, for example, is creepy and features iconography associated with the Great Old Ones, and watching the strange worship may well show that some villagers are becoming pseudonatural! The night is also haunted by a nightgaunt, and dreams of the mythic kingdom of Iskandar beset those dreaming. Ultimately, the PCs will need to retrace Alra’s footsteps past the many branches of the Little Wander River, where remnant of fight with river folk have attracted leshy to the corpses, witchlights can lead the PCs into the hungry embrace of carnivorous plants, and Alra’s abandoned campsite has been taken over by Zoog. The next of aforementioned nightgaunt, strange and unearthly, would be an odd further place. Nice: these sections allow the GM to slowly establish an atmosphere of ever-growing apprehension, which culminates in the dungeon that makes up the main meat of the module. You see, the complex that Alra’s trail leads to would be the Dreamer’s enclave, once used to control a vast swath of the region. The arrival of hapless Alra has resulted in the Dreamer awakening, taking a form imitating the sought after shade of Iskandar. The complex itself is rickety and multiple potential partial collapses must be contended with; partial flooding and cool haunts complement this section. The choice of monsters is nice and there even is a small bit of roleplaying interspersed here. Ultimately, the PCs will hopefully find Alra. Whose mind has been subjugated. Subduing the sage can provide a redemption-angle for the PCs to help with, which is a nice touch – but in order to actually triumph here, the PCs will have to collapse basically a kind-of-overlap/transition to the Plane of Dreams, and defeat the dreaded “Shade of Iskandar” – who turns out to be a rather potent nightmare lord mi-go! The pdf comes with all relevant stats; the original layout file was lost, though, so one comment sports a replacement creature – I don’t mind, as the proper replacement is valid and nice, but I figured I should mention that. Editing and formatting are good on a formal and rules-language level, I noticed no serious accumulation of hiccups. Layout adheres to a 1-column b/w-standard with purple highlights and is printer-friendly. The full-color full-page artworks of monsters sported herein is Nice. Cartography is solid, though the lack of a player-friendly map is a bit of a bummer. The pdf comes fully bookmarked for your convenience. 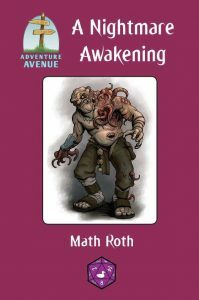 Matt Roth’s “A Nightmare Awakening” is an unpretentious, well-crafted swamp-expedition with a mythos-angle; it doesn’t reinvent the wheel, but it is tight in its representation of the tropes and themes we expect from the genre. The convenience of the tables and generally solid use of haunts, traps, etc. mitigates somewhat the absence of player-friendly maps. The star here, what elevates this module above many of its brethren, would be the smart use of unique terrain in conjunction with the previously-mentioned complications. The module does not feel sterile, and the dungeon manages to feel dangerous not by virtue of throwing tons of enemies at the PCs, but by means of its features. That’s a big plus for me. If you want just a dash of cosmic horror/dark fantasy with a mythos bent, then this delivers – it does not swamp you in hopelessness and does not require a plethora of subsystems to generate tension. This is not a brutal purist’s module, and, while not easy, it will not leave the PCs crippled or gibbering. In short: This is a nice piece of genre-writing, and as such, it deserves a final verdict of 4 stars. You can get this nice genre-module here on OBS!